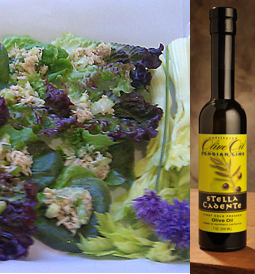 Wild Planet Tuna Salad in Lettuce Cups with Stella Cadente Persian Lime Olive Oil - A recipe from Savor California, the online showcase for extraordinary gourmet foods and beverages from California. In a small bowl, combine lime juice, zest, salt and pepper and Persian Lime Olive Oil. Whisk to combine. Shred tuna into a bowl, mix with celery and onion. Toss tuna mixture with dressing. Arrange lettuce cups on a platter and fill each with a spoonful of the tuna salad. Drizzle with additional Persian Lime Olive Oil and serve.